YIELD is an independent design house: part industrial design studio, design label and manufacturer. YIELD designs and manufactures a range of bags, jewelry, and goods for the home with an aim to pair American craft and ingenuity with an eye toward the future. YIELD’s products are sold in over 250 retailers in the U.S. and abroad and have been featured in numerous publications such as the New York Times, Dwell, Sunset, SF Chronicle and more. French Press: 850 mL Ceramic French Press. Brew perfect, full-bodied coffee in the traditional french press method. This heavy walled ceramic press pot is a functional and beautiful addition to your kitchen table. The ceramic body maintains a consistent temperature throughout the brewing process. Matte ceramic exterior, high gloss interior finish. Certified SGS Food Safe. 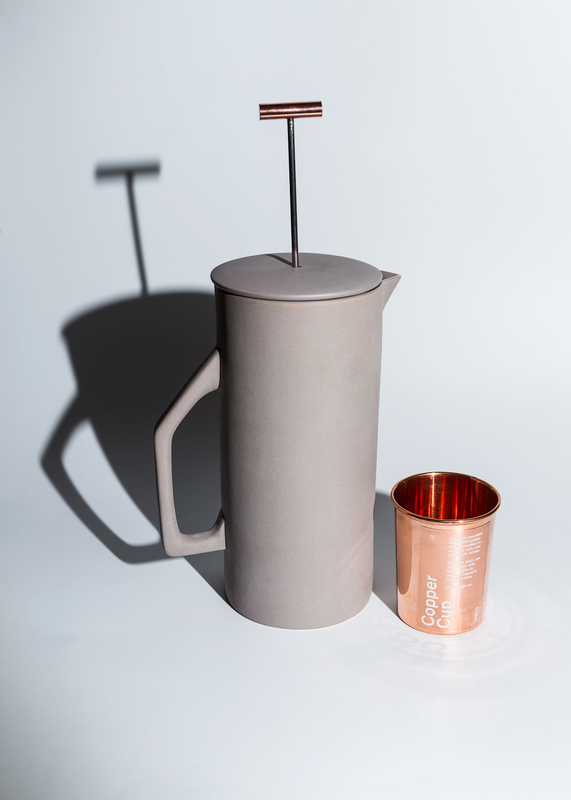 Copper Cup: These beautiful copper cups are functional, stackable, and versatile. Copper has qualities that make for an excellent drinking cup: the material is naturally insulated and antimicrobial. Great for use in the home or outdoors. Due to the natural material, this cup will develop a beautiful patina over time or you can choose to keep it bright and shiny with a simple cleaning.